That's right. 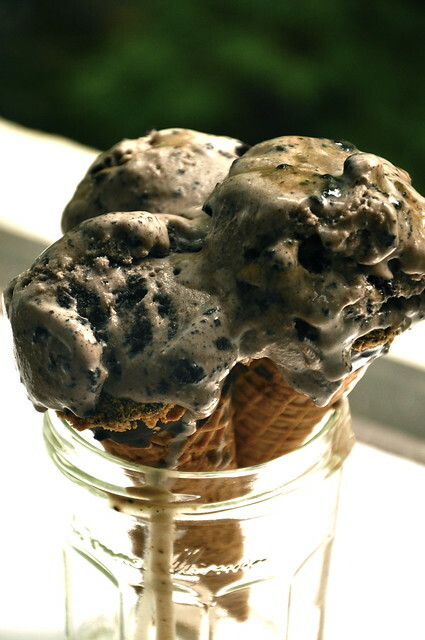 Cookie Crumble Ice Cream with Espresso Caramel Swirl. Now try saying that ten times fast. It's a mouthful, huh? And I bet you wish you had a mouthful of this very ice cream right about now. You know I've said it before, and I'll certainly say it again, but I just love ice cream. I do. Ice cream and cookies. That's all I need to be a happy girl. So when the two come together in one unbelievably delicious package? Well, let's just say I'm pleased. I've been back at school for a little while now, but my flatmate and I are clearly a little touched in the head, as we've only just figured out how to turn on our oven. Before you write us off as complete ding dongs, I should mention it's an AGA (for the uninitiated, it's a heavy cast-iron stove and cooker that stays on all the time). Needless to say, I haven't been spending all that much time in the kitchen, save to throw together a sad salad or two. Sadly, I won't be whipping up anything super exciting in the next week, as I'm heading off to Iceland for a few days- though, let's be honest, I'm not that sad about it. But, in the meantime, I wanted to leave you with a little treat while I'm away, and I promise I'll be back in full force very, very soon. P.S. you will have cookies left over. To make the cookies: Preheat the oven to 375. Line two baking sheets with parchment paper. In a medium bowl, whisk together flour, cocoa powder, baking soda, baking powder, and salt. In the bowl of a stand mixer, cream together sugar and butter. Add egg and vanilla and beat to combine. Beat in dry ingredients until just combined. Using a 1 1/4-inch ice cream scoop, drop dough onto prepared baking sheets. Bake for 10-12 minutes until tops of cookies are firm and dry. Transfer to wire racks and let cool. To make the caramel: In a medium saucepan, heat brown sugar, butter, maple syrup, espresso beans, vanilla extract, and salt until butter is melted. Pour in 1/4 cup of heavy cream and bring to a boil, whisking until sugar is dissolved. Reduce heat to low and continue to boil for one minute longer. Remove from heat and set aside to cool. 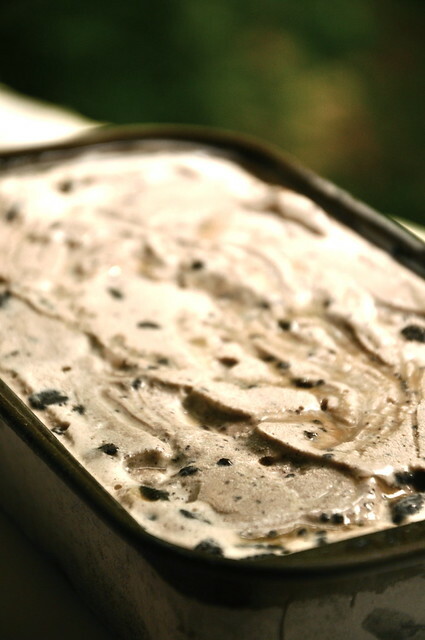 To make the ice cream: In a medium saucepan, combine sweetened condensed and evaporated milk. Scrape seeds out of vanilla bean into saucepan, drop in bean, and heat over low heat until just about to simmer. Transfer to a clean bowl. Add heavy cream and stir to combine. Let cool in fridge for a few hours. 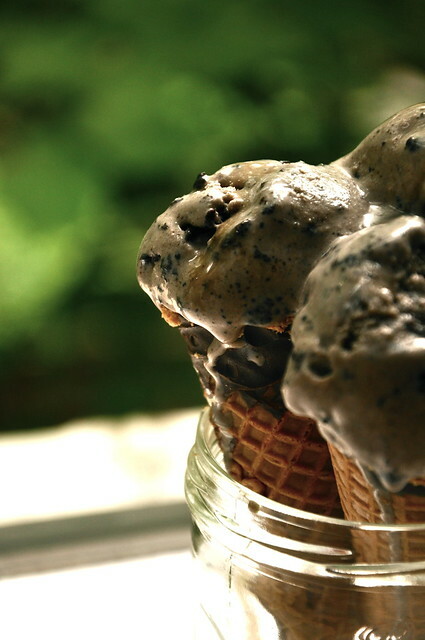 Once cool, strain mixture through a fine mesh sieve into an ice cream maker and freeze according to manufacturer's instructions. Five minutes before ice cream is done, add 1 cup crushed cookies to ice cream. Once ice cream has finished, spoon 1/3 of ice cream into a tub. 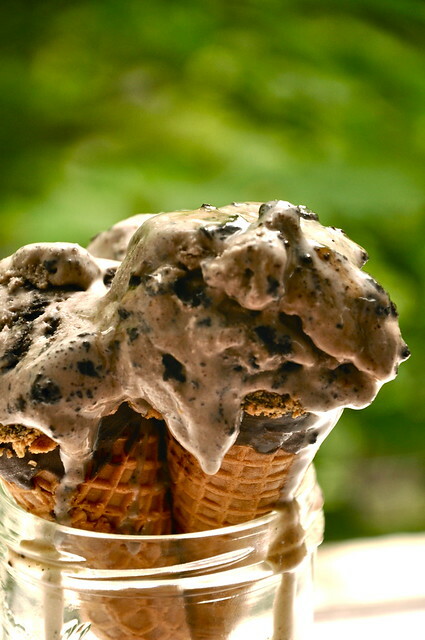 Drizzle a few tablespoons espresso caramel over top of ice cream and swirl through with a knife. Repeat twice more with remaining ice cream and espresso caramel. You will likely have espresso caramel left over. Freeze until ready to serve.